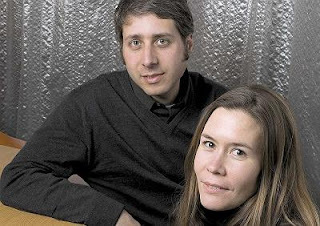 Martin Felsen & Sarah Dunn get Archeworks! The important design school for social concerns started by Stanley Tigerman and Eva Maddox. Congratulations! You’ve been having a great year or two. He’ll put it in Louis Sullivan’s inspiring department store building on State Street. Carson’s – the store in there for decades, recently vacated. Mau’s school will be in the same building as, and he will team up with Tony Jones and The School of the Art Institute of Chicago, which recently began teaching architecture on the top floors of the Sullivan masterpiece. Bruce Mau said he intends to focus his activities on cities. He plans to develop “Chicago prototypes.” He hopes city planners and leaders around the world will note his achievements here, come here to study them, and then replicate them where needed. He told me that a developer working on a project in Korea wants to fund the prototype here, and if or when it’s successful, replicate the solution in Korea. I have no more details on that. Mau will live on Chicago’s North Shore; he’s looking for a grand old house to turn “smart.” With all the visitors he expects he joked it’ll be something of an “eco-resort.” Tell that to the good ladies of Winnetka. How did this come about? Bruce Mau said that he was gratified by the welcome he received in Chicago when he brought his exhibtion “Massive Change” to the Museum of Contemporary Art. He had lunch with Stanley Tigerman. Tigerman asked him, “What are you doing? Why aren’t you here?” Tigerman told Mau he could accomplish in ten years in Chicago what it would take him forty years to acheive in Toronto. Next thing you know, Mau’s moving his family to Chi-town and opening a school here. Bruce Mau says he’s a big fan of Mayor Daley and the work he’s doing to make Chicago more “green.” Daley is also a fan of Mau and his work. Finally, Bruce Mau says it’s too late to tone down the expectations people have for him, but that he’ll work here to realize his dreams here. The “City of Broad Shoulders,” “the City that Works;” the city of “Make no Little Plans,” and “Build, Don’t Talk,” welcomes its latest big thinker. I’m so glad to see him come here and help spur the Chicago Renaissance. Welcome Bruce Mau and family. Make the place grow. This biennial event will once again feature a live auction with drawings by today’s most recognized and respected architects, designers and artists. 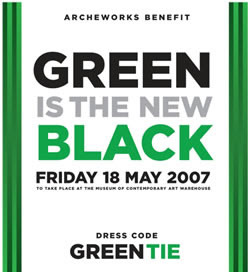 Event proceeds to benefit Archeworks’s Community Design Projects. What, no martinis? jk, see you there. You are currently browsing the archives for the Archeworks category.